Ray Jackson, whose unique mandolin, harmonica and vocal styles helped create the original sound of Lindisfarne in the 1970s, is back, and will be performing live in Bradford with his new Lindisfarne Mk 3 band later this month. Last year a date for Ray Jackson’s legendary Lindisfarne Christmas Show was announced... Jacka’s first Lindisfarne show for 23 years! After originally only intending to perform a single show at Newcastle City Hall on December 23rd 2013, (which sold out within hours of being announced), a 2nd and 3rd show was announced which resulted in all tickets being sold, such was the demand. Following subsequent tour dates in 2014, Lindisfarne now play Bradford in their only Yorkshire date on Wednesday 17 December. The new Lindisfarne Mk 3 bandis comprised of five former members of Lindisfarne from all three past eras.They are: Ray Jackson (mandolin/harmonica/lead vocals) Lindisfarne founder member, Dave Hull-Denholm (guitars/lead vocals) and Ian Thomson (bass guitar/double bass/vocals) both from the 1990s Lindisfarne line-up, Charlie Harcourt (guitars/vocals) from Lindisfarne Mk 2, Steve Daggett (guitars/keyboards/vocals) who toured and recorded with the original line-up who reformed in 1978, Tom Leary (fiddle) special guest from Feast Of Fiddles who performed with the new Lindisfarne line-up last year and Geordie drummer Paul Thompson, known by Roxy Music fans worldwide as “the great Paul Thompson”. 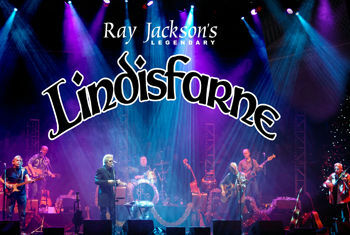 Although nothing could ever replicate the original band, during an interview in May 2013, Ray Jackson explained that the new line-up was musically so exceptional and sounded so like the original Lindisfarne and that they were all developing so very much in rehearsals that he has decided to continue with his 3rd Lindisfarne line-up for the foreseeable future.